Bonus playing cards are made in US and can buy online or in shops in USA and some other countries. In China it's difficult to buy Bonus cards but we import the cards from foreign countries. We mark the nice Bonus playing cards with invisible ink by machine, which is an advanced technology now. These marks with numbers and suits is invisible to any naked eyes. But you can see it clearly with our poker contact lenses or infrared sunglasses. 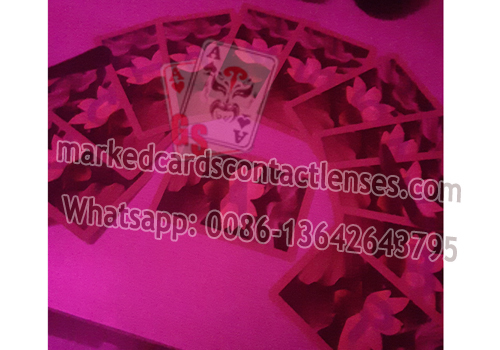 We are professional marked cards supplier from where any brand of marked playing cards are available. We have the most latest and advanced technology and machine for marking cards. As for the Bonus, just let me know if you need the jumbo index, standard index or others. If you can't see the right Bonus in my site, then just contact me for more pictures and information of the marked decks. You can also send me your original playing cards so that we can mark them with invisible ink marks.